Students will learn about the concept of using "words as art" and build their own story around the American flag. 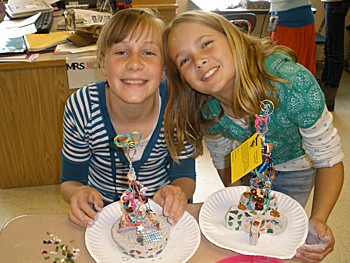 Understanding the concept of "words as art"
View training video of this project for grades 3-5. View training video of this project for grades K-2. Alberto Giacometti expressed transparent presence in his work. Students will learn about the importance of "gesture" when sculpting. They will create their own Giacometti influenced stick figure in wire and learn traditional concepts of positive and negative shapes and suspending line in three dimensions. This lesson will explore the life and work of Japanese artist Katsushika Hokusai. Students will create their own Hokusai Wave using oil pastels. Project will focus on shading techniques and warm and cool colors. The Perspective of Mt. Tahoma"
In this project students will explore the history of Mt. Tahoma (Rainier) and the unique realm of perspective and point of view in art. They will paint their own Mt. Tahoma in perspective on three fiberglass squares with foreground, middle-ground and background elements.